Cycling itself is a relatively safe activity, however there can be dangers, many of them caused by other road-users and their bad driving. For this reason, while there's no need to regard cycling as dangerous or risky, you nevertheless should take safety into account at all times. A few simple precautions and a bit of extreme can dramatically reduce your chances of being in an accident or having a collision. Always look ahead and try to anticipate what other road-users might do. Not all drivers are perfect, far from it, so make allowances for bad driving. You need to be alert at all times when riding your bike. If you are unable to concentrate properly properly on the traffic because of tiredness, drink or whatever reason, you simply shouldn't be cycling. Don't wear headphones or headsets when cycling. This includes both music or mobile phone headsets. They are both a distraction from cycling, and also make you unable to hear what is going on around you. If you really can't live without them for a few minutes, then don't bother cycling, take the bus instead! Choose cycling clothes that are warm, breathable and which will keep you dry. If you become wet and cold (or too hot on sunny days), it's easy to get distracted, and stop paying sufficient attention to what you and other road-users are doing. Safety should also be a consideration in choosing cycling clothes. In fact the main consideration, and fashion should be secondary. A cycling helmet will protect you head in many types of accidents, and wearing clothes that make you easily visible will reduce the chance of an accident in the first place. Additionally, don't wear a hood when you cycle, as they restrict your vision, and if you turn your head to glance over to look a the traffic, you'll probably just end up with a view of the inside of the hood. As well as wearing high visibility clothing, you should also get lights and reflectors for your bike. These will also help in making you visible to other road users, and are useful not just at night, but also in bad weather. 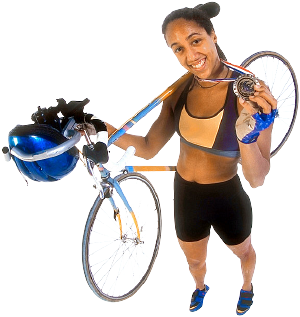 You should also maintain your bike carefully, and make sure it is roadworthy at all times. Pay particular attention to brakes, as sometimes you may need to stop suddenly in order to avoid a collision. Remember that you are just as entitled to use the road as cars are. Of course you don't want to be a road hog, but many cyclists make the mistake of creeping along right next to the gutter, and thus lose all ability to manoeuver. Yes you want to be consideration of other road-users, but if there isn't enough room for a car to pass you, you don't want to give them so much room that the driver is tempted to squeeze past you anyway - instead in narrow sections of the road, move to the center of the lane, and only move back to the edge to allow cars to overtake when the road is wide enough for them to do so safety. Think about what other road-users expect you to do. For example, car drivers generally aren't concerned about drain covers or small potholes, so you will take them by surprise if you suddenly swerve to avoid this type of obstacle. Likewise, if you're speeding through slow moving traffic, if you're on the inside, watch out for cars turning into side roads, and if you're on the outside, watch out for cars pulling out suddenly into gaps. When many people get out of parked cars, they don't check for cyclists, so you need to be vigilant in case of people jump out of vehicles unexpectedly. Look out for parked cars with people sitting in them, and be especially cautious near places like train stations and cash-points where people have a tendency to suddenly jump out of vehicles even in slow moving traffic. Trucks can be incredibly dangerous to cyclists, because even though they have mirrors, the driver may well be unable to see you. For this reason, you should keep well clear of them at all times. You should also never position yourself the inside of a truck, as if the truck turns into a side road, you will have no escape.